Traditional weddings require traditional wedding cakes. Contemporary weddings at unique venues require whatever your desires and imagination can come up with. 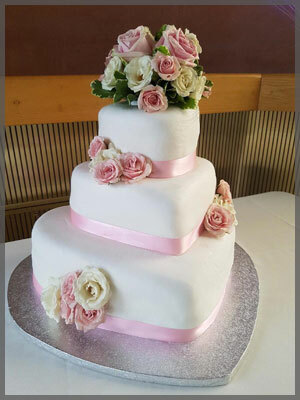 We at Yankee Lady Cruises are happy to help provide whichever type of wedding cake suits your event. 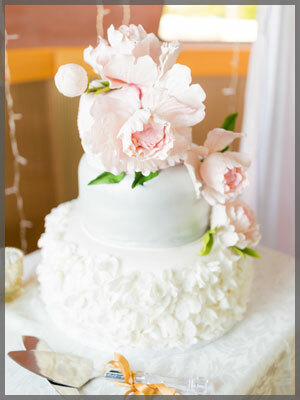 We have a wedding cake baker that will help you have that tasty treat just the way you want it. Or consider cupcakes on a wedding stand. Or if wedding cake isn’t your thing, perhaps consider one of the following sweet options. Who doesn’t love liquorice, lollipops, and candy? Show off your sweet tooth with a table-top display brimming with all your favourite candies. At a cost from $6.00 per person you can satisfy all the sweet desires of your guests. This tasty display may be customized to suit your colour scheme. Keep your cool with an ice cream sundae bar. A terrific idea for hot summer weddings. Vanilla and chocolate ice cream with a selection of toppings including fudge sauce, smarties, sprinkles, nuts, etc. Offer a healthy treat and create a buffet of healthy fresh fruit. Serve up tropical treats like mangoes and papayas. Or provide a fruit to match your theme; if red is one of your colours, consider a fruit bar made up of raspberries, strawberries and red delicious apples. You can’t go wrong with chocolate. For a delectable treat, we can provide a 3 foot chocolate fountain. Dip skewers of fresh fruit, rice crispy squares, marshmallows, macaroons, or any tasty treats you desire. Or give out chocolate dipped strawberries as your guests disembark from the ship. 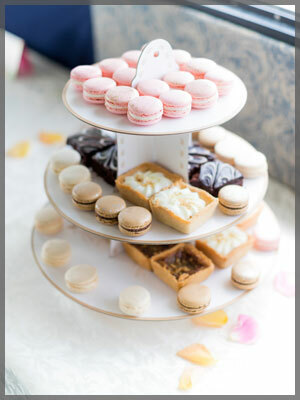 Treat your guests to a pastry table packed with sweet delights including tarts, cookies, small finger pastries and mini mason jars filled with mouth-watering treats. How about a live crepe station, served hot directly from the pan, covered in a tasty grand marnier sauce and surrounded in berries and served a la mode (ice cream). Whatever your taste buds demand, is our Yankee Lady command. We look forward to customizing your special day and cruise your way!